This is going to be my first attempt and im just in the planning stages and aquiring materials,ive had to buy a riser(6"enamelled stove pipe) and a 45 gal drum,i was thinking about rigid metal ducting for the mass,though i do have access to plenty of red bricks(victorian) could i build a brick tunnel through the mass?I want to site the burner at one end of the GH and run a straight tunnel through the mass to a chimmney. 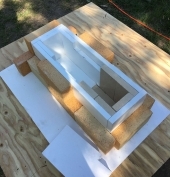 how far off the chipboard walls should the burner be?Could i line the walls with foil and fill the space with insulation topped off with cob(this will direct the radiated heat into the GH?) the polycarb roof will be 5' above the drum will that be enough of a gap.Im looking to keep the GH at 20oC so how deep should the urbanite and cob layer be above the tunnel ?how long would i need to burn to get enough heat into the mass to last all night? Ian Ballance : YES ! Go for it with gusto ! I believe that you are taking about 45 Imperial gal, the same as 55 gal U.S. If your not sure we can figure it out by measured size, or # of liters. You want the very smoothest walls within your cob bench you can get! You would have to plaster the inside walls of your brick tunnel, and any failure of the plaster could really slow things down ! Better to put a sealant and a vapor barrier against the chipboard, (cob sweats), then an air space then reflective foil and then cob ! More reflection of heat ! If you can keep insulation dry you could try some after your Green house air gap, - and the foil, but keeping it dry if it contacts the outside wall will be an issue ! If you can get what we call cement board, and cover it w reflective foil, you can hang it between the roof/ceiling and the barrel, that should solve that problem, tho a fan may be needed too. If we talk about the cob Bench only in terms of its height, then you can build it to give you a great working height, and have nice warm seedling beds ! Later you may have to leave an air space between plants and your bench as you will want more heat in the G.H. air after your plants are started -they have to be hardend off, Right ! I think you will have to talk to a lot more Green House people to get a handle on depth of piping and height of your cob, its a little out side my wheel house ! I want to mention that you will need to store your wood outside the Green House to keep it dry and the # of trips you will need to feed your stove*, the dragon that lives in your Rocket Stove gets hungry and needs to be fed often with small dry wood for best results! Your ear will tell you when your wood stove needs to be fed, !3-4 hrs of feeding while you are puttering around your green house will get you 20-24 hrs of heating ! - G'Luck - Pyro maticly Yours! A.L. * a simple air lock with hanging barriers to slip through is the best I can come up with , others will have other Ideas ! Again, I am not any kind of an expert on Green House Structures, and this is kind of a new field ! A.L. Ian Ballance : in-ground you may have additional problems with traditional cob becoming spongy, and the stove pipe in your cob bench being exposed to the combination of water and lye from your wood ashes, due to an artificially high water table in your green house saturating your floor, again I am not an expert here but every G.H. I was ever in had some kind of membrane on the floor, or was very muddy! - Y.M.M.V. I am guessing that it may be a little late to install a french drain in your G.H., - g'LUCK< - Pyro-maticly Yours, - Allen L.
Thanks once again A.L. Greenhouses seem to require a bit more thought,as you say they are a damp environment so i might have to experiment with a different medium for the thermal battery.Would a sharpsand/peagravel mix work with larger lumps of urbanite embedded then topped with paving slabs? Perhaps a layer of insulation under the ducting to deflect the heat upwards? How have others overcome this problem? Ian Ballance : what you said, - for many people on these forums 'sharp sand' means 'Diatomaceous Earth' or even pool filter sand, I think that you and i both mean builders sand with its sharp corners, rather than beach sand with round corners. Because local seasonal weather variations, and even localized greenhouse traditions of use affect the Moisture content with in the G. H., could you tell me where, and at what altitude you wanted to make your greenhouse ? In a perfect world the solution to wet earth is ditching that someone else has already done, If I wanted to use the earth in my greenhouse for a growing bed even before building the G.H. i would move the earth, put in french drains below ground and 'going to daylight' at a lower location . This will need protection from filling in with landscaping fabric/silt cloth. 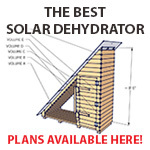 'Then ' you could replace your earth and build your green house ! On top of that you might be able to build with cob or use your alternative, remembering the moisture in the air is artificially driven by the transpiration of healthy,well-watered plants ! 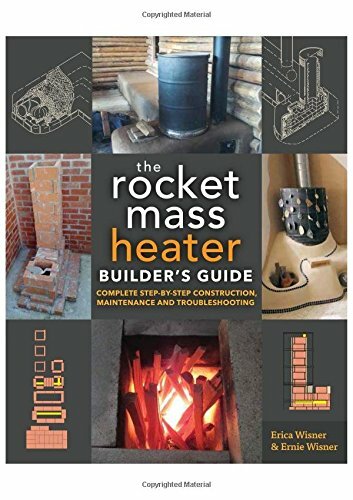 Greenhouse use is seasonal and now is the slow season, now would be a good time to talk with a Mom And Pop commercial green house owner, about his operations, Take along a copy of Ianto Evans' Great book 'Rocket Mass Heaters' and show him what you want to do ! Due to the high cost of fossil fuels I am sure that you will get a receptive ear! A favor, could you contact me at 'Rocket stoves in greenhouses, a forum of our own' this should connect back here through 'forum threads others have visited' link hope some of this helped, Pyro-maticly yours Allen L.